Something that we at the Society of Healing Arts enjoy practicing is mindfulness in conjunction with yoga and other natural remedies for common illnesses that plague us today. It can sometimes be hard to explain certain aspects of mindfulness so we love this visual representation of the core principles of mindfulness. Enjoy! We make mindfulness practice fun and kid-friendly by integrating it into play, games, stories, arts, visualization, or movement — all the natural ways children learn and explore the world. There is growing research on the importance of play. (In fact, another child mindfulness teacher told me that she was recently asked, “Is play the new mindfulness?”) Visualization is playing with the imagination, a powerful resource for both children and adults. A snow globe or glitter jar is one of the most powerful visual metaphors for that connection; it illustrates how mindfulness — the cultivation of stillness in the face of swirling chaos of life — affects us. 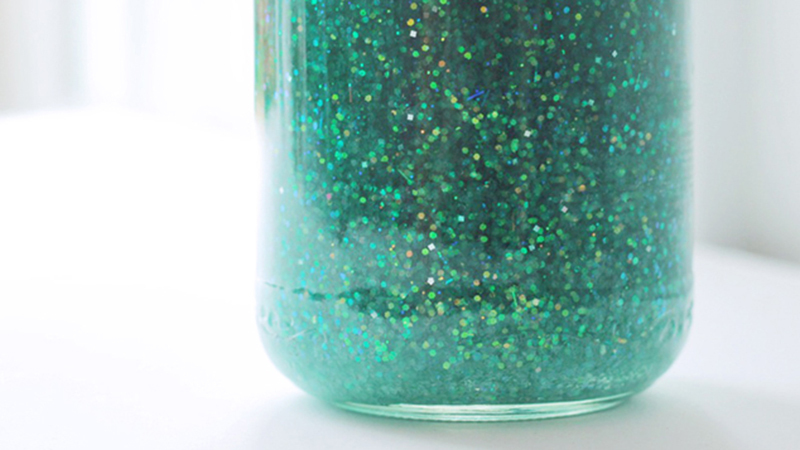 In this practice, you can actually make a glitter jar. At first I used to do this practice only with young kids, but I’ve since found that even teens enjoy it. You can use a mason jar, a spice jar, or even a plastic water bottle for this practice. Be sure to use glitter that sinks rather than floats. Adding some glycerin to the water slows down the fall of the glitter. Fill the jar to the top with water. Have your children pick three colors of glitter: one to represent thoughts, one to represent feelings, and one to represent behaviors (or “urges to do things”). Drop a few pinches of each color glitter into the water, which represents their mind. Seal the jar with its lid or duct tape. The jar is like our mind, and each color of glitter represents something different in our mind. Now we seal up the jar. (Put the lid on the jar and seal it.) Then we start our day. But pretty soon, things start swirling around. Maybe we are running late (swirl the jar). Our big sister eats the last pancake for breakfast, and it leads to a fight (shake the jar). We hear scary things on the news in the car ride to school (swirl the jar). We get to school, and find out we aced the test (shake the jar). Now it’s only a few minutes into the school day, and we can’t see clearly because all of our thoughts and feelings and urges are getting in the way. So what is the one thing we can do to get the glitter to settle and see clearly again? And what happens when we are still? That’s right — we can see clearly again. When things become clear, we’ll know the wise next thing to do. In fact, that’s one definition of wisdom: seeing things as they are and choosing how to act. While we wait, does the glitter go away? No, it stays at the bottom. Our thoughts and feelings and urges are still in our minds, but they are no longer in our way, clouding our vision. A finished glitter jar can serve as a visual timer for other practices, such as breathing practices. For example, you can shake the jar and say, “Let’s do some mindful breaths until the glitter settles.” Some families use the jar as a “calm-down jar,” to mark and measure calm-down time. Ideally, the entire family can use the calm-down jar together when there is a conflict: “We are all upset with lots of thoughts and feelings right now. So let’s all take a break until the glitter in the calm-down jar has settled and then start talking again.” There are even a few glitter jar and snow-globe smartphone apps, which one kid I work with just loves. There are many images that can act as an anchor. Consider what makes sense in terms of what your kid knows, what they like, and what will resonate with them as you guide them through a practice grounded in visualization. Adapted from Growing Up Mindful: Essential Practices to Help Children, Teens, and Families Find Balance, Calm, and Resilience by Christopher Willard, PsyD. Copyright © 2016 by Christopher Willard, PsyD. To be published in June 2016 by Sounds True. Christopher Willard, PsyD, is a clinical psychologist and consultant specializing in bringing mindfulness into education and psychotherapy. The author of Child’s Mind (Parallax, 2010) and other books on the topic, Dr. Willard lives in Cambridge, Massachusetts and teaches at Harvard Medical School and Lesley University. For more, visit drchristopherwillard.com.